"Then, after some moments we saw the same Pope entering a Church, but this Church was the Church of hell; there is no way to describe the ugliness of that place. It looked like a gray cement fortress with broken angles and windows similar to eyes; it had a beak in the roof of the building." Above, the reader sees Mary Queen of Peace Church, built in the pilgrimage city of Neviges, Germany. The edifice quite aptly fits the description of the message, as was already pointed out: e.g. 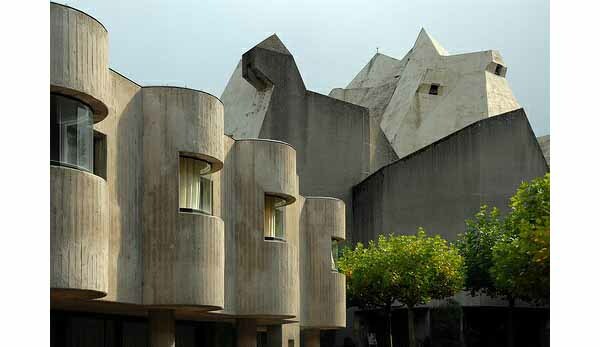 a concrete fortress, strong angles, a beak on the roof (in the background at left), and windows that look like eyes (in the foreground at left). Even though we did not find a picture of Pope Benedict XVI entering that building, probably Joseph Ratzinger entered it many times as a priest and a cardinal. It was quite interesting to learn that the construction of this church was the initiative of Cardinal Joseph Frings of Cologne, who commissioned it on June 15, 1964, a time when Fr. Ratzinger was his private secretary. It was inaugurated on May 22, 1968 by the same Cardinal. First row below is the Cathedral of Los Angeles, well-known to our readers. In the second row, Holy Trinity Church in Vienna, Austria. 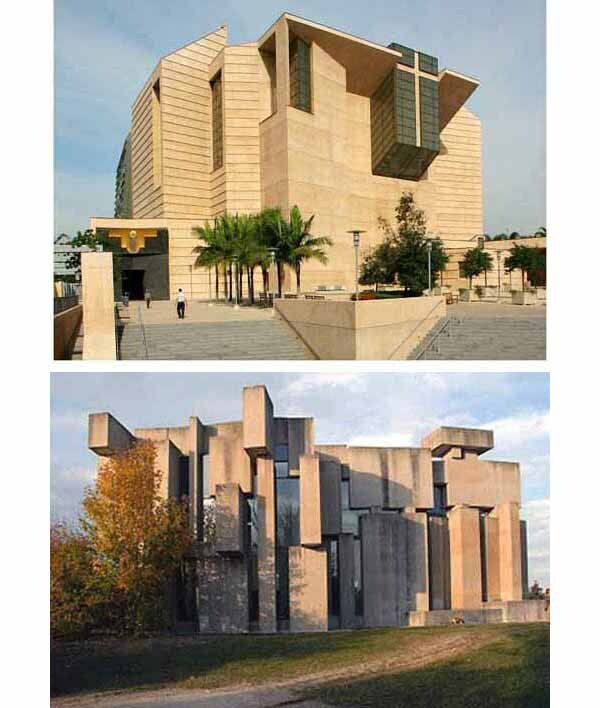 Third row left, Notre Dame du Haut, Ronchamp, France; right, Santa Monica Church, Madrid, Spain. 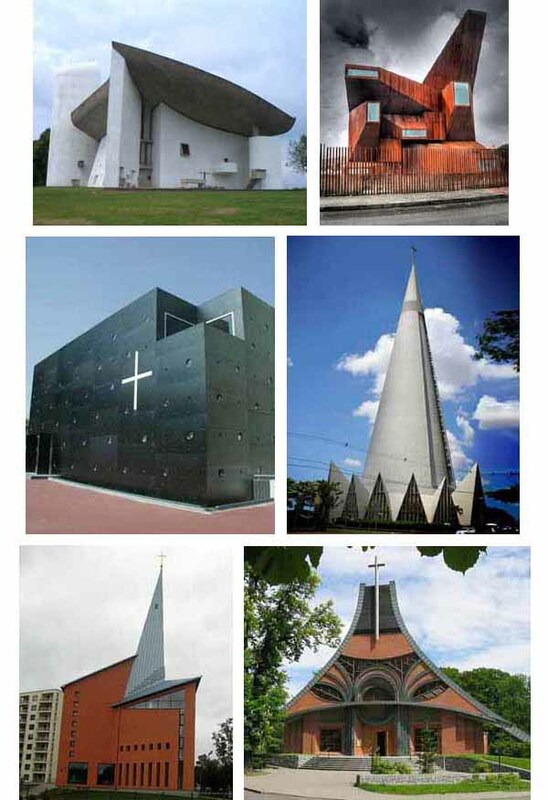 Fourth row left, Christ Hope of the World, Donau, Austria; right, the Cathedral of Maringa, Brazil. Fifth row left, Holy Trinity Church, Riga, Lithuania; right, Exaltation of the Holy Cross Church in Chucelna, Czech Republic, with windows that look like eyes. If our readers have other pictures fitting the description that they would like to share with us, we welcome their contributions.